Proficiency awards winners were (back row, l-r) Kylee Winner, Kenzie Singer, Blake Thomas, Isaac Barga, (front row, l-r) Carrie Rhoades, Kaydee Campbell and Andrew Thornhill. Service awards went to Bob Mayo, Darrell Gower, Nick Mayo, Charlie Prasuhn and Jamie Campbell. Star Greenhand was awarded to Garrett Brown and the Star Chapter to Thomas Grow, who has seven years of ag by one of the advisers, Emily Williams. Robert Christman, she said, will be presented the American Degree at the National Convention this year and was recognized for that achievement. Proficiency awards were presented to Blake Thomas in Ag Sales, Kaydee Campbell in Swine Production and Poultry Production, Kylee Winner in Sheep Production, Carrie Rhoades in Dairy Production and Nursery Operations, Andrew Thornhill in Specialty Crop Production, Mackenzie Singer in Beef Production, and Isaac Barga in Diversified Crop Production. Winter fruit sale winners were Ethan Fisher, first; Jessica Thomas, second; and Deanna Moody, third. Spring fruit sale winners were Isaac Barga, first; Hannah Hartzell, second; and Blake Thomas, third. Those recognized in Participation Point System were Jacob Prasuhn, first; Rebekah Prasuhn, second; Jessica Thomas, third; Isaac Barga, fourth; and Isaac Oswalt and Kierra Reichert, who tied for fifth. The following top scoring individuals received Career Development Event awards: Thomas Crow in Rural Soil Judging, Jacob Prasuhn in Urban Soil Judging and Ag Power Diagnostics, Rebekah Prasuhn in Novice Parliamentary Procedure, Mackenzie Singer in Advanced Parliamentary Procedure, Carrie Rhoades in Job Interview and Prepared Public Speaking, and Preston Holton in Creed Speaking. It was noted that the wildlife, general livestock and dairy judgings haven’t been held at the time of the banquet. Carrie Rhoades and Kaydee Campbell also were recognized for being state choir members. Guest speaker for the evening was Koleson McCoy, the Ohio FFA president for 2018-19. He grew up in Springfield and plans to return to The Ohio State University in the fall after a one-year hiatus. “I have been looking forward to this banquet for quite some time,” he told the crowd. “I’m glad to be back in Midwest Ohio. He talked about positive challenges and positive changes. 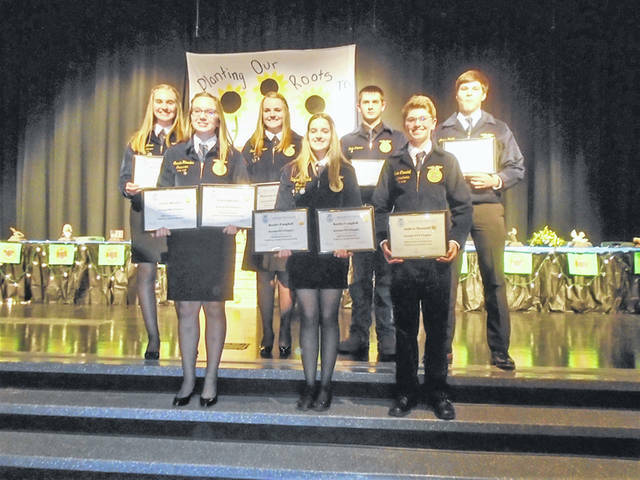 Aaron Scammahorn, in his first year as adviser for Ansonia FFA, presented special awards to groups and individuals who help support the chapter. They included Ansonia FFA Alumni officers; Ansonia Board of Education; Ansonia Local School administration, teachers and staff; elected county officials; parents of FFA officers and chapter volunteers. Williams has been an adviser for five years. Another highlight of the evening was the installation of new officers: President Mariah Troutwine, Vice President Cody Williams, Secretary Kenzie Singer, Treasurer Kylee Winner, Reporter Carrie Rhoades, Student Adviser Andrew Thornhill, Sentinel Kaydee Campbell, Historian Garrett Brown and Parliamentarian Deanna Moody. This entry was tagged Ansonia, Ansonia FFA, Ansonia FFA Banquet, FFA. Bookmark the permalink.